If you are off on holiday in July or August, this summer issue is worth taking along for reading on the plane or on the beach. Luca Volpe, a long time favourite with us in the Magicseen office, stares dramatically at you from the cover, and inside we not only get a rundown of Luca the man and performer, but he also has time to pass on some sage advice too about stand up mentalism. This issue also includes features on George Iglesias, and Magic Singh, who returns to our pages after a gap of 10 years from when he was on the cover as a younger man! Jez Rose is a great guy and has carved a substantial niche for himself in the business world with his hosting of large corporate events and his motivational speaking. In this issue, Jez lifts the lid on using magic for public speaking and reveals what is involved and indeed what it takes to be successful in this specialised field. We also have an article for children’s entertainers which looks at 10 different ways to make children laugh, most of which require no actual props! What else lurks within the pages of your fav mag this time? Well, The Masterclass has two more effects for you to learn, including one which is probably the most unusual idea we’ve ever featured in Magicseen, there’s another selection of Lookalikes (how on earth did I end up in there? ), we get In The Phonebox with soccer star Olivier Giroud who is a bit of a magic fan, and the Reviews Section contains comments on some top quality products. All and all it’s a busy issue, just try not to get any sand in the pages! Magic Seen Iss 81 (July 2018) If you are off on holiday in July or August, this summer issue is worth taking along for reading on the plane or on the beach. 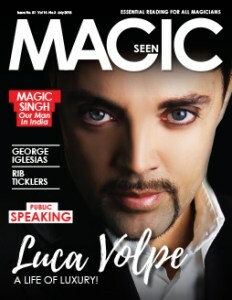 Luca Volpe, a long time favourite with us in the Magicseen office, stares dramatically at you from the cover, and inside we not only get a rundown of Luca the man and performer, but he also has time to pass on some sage advice too about stand up mentalism.